Does the newborn shake his chin need to panic or not? Quite often young mothers, especiallyInexperienced treat their babies with a special, and sometimes excessive trembling. They begin to worry about it, and without it. So, the question "why does the newborn have a chin? ", Every mother asks herself, probably. At least with the first child for sure. Let's try to understand, because of whatThe chin of an infant is shaking, in which cases there are no reasons for excitement, and when it is still worthwhile to show the baby to the doctor. If a newborn has a shaking chin, and also hands or feet at the moment when he cries, there is nothing to worry about. In children up to three months of age, the tremor is not considered pathology. These involuntary twitches of the muscles on the face, arms or legs are due to the fact that the little man still has immature nervous and endocrine systems. A baby younger than three months old has not yetThe processes of development of nerve centers that regulate and control motor reflexes have come to the end. In addition to this, norepinephrine, excessively produced by immature adrenals, exacerbates such manifestations of emotion. In the end, it turns out that the kid tries to express his desire to eat or chat, but it turns out a kind of "hysteria" of the muscles. Most often it is the physical load (and hereYou can also include sucking breast milk) and emotions (the joy of the mother's presence or the fear of loneliness in the room, just the desire to communicate) are the causes that trigger the tremor of the chin, hands or feet in the baby. The kid is just overexcited. But my mom should be on the alert if the baby does notStrained (including eating), did not cry and did not experience other emotions (for example, he woke up alone in the room and did not see anyone next to him), but at the same time he has a tremor of limbs or chin. Arising involuntary twitching of the muscles inSuch a situation can be signs of hypertonicity of the musculature. Here, of course, you need a doctor's consultation. Only he will decide how to help your baby relax the strained muscles. In such situations, as a rule, it is recommendedRelaxing massage, warm baths with broths of lemon balm and mint, as they have a calming effect on the nervous system. Such baths are made no more than three times a week, as broths can cause allergies. Not bad helps also foam for the bathroom or a little for the skin with lavender. You can hang in the arena (on the back, or put in the legs under the mattress) cushion with dried collection of soothing herbs. But, firstly, only with the permission of the doctor,Because the aroma of herbs can cause an allergic reaction from the respiratory system, and secondly, for the same reason away from the child's head. Do not need intensive exposure - a light enough aroma. In cases where your child has more than threeMonths, or at the child the chin, but also all head shakes - immediately address to the doctor. Obsessive muscle twitching can be a symptom of serious pathologies of the nervous system. Hypoxia of the fetus during pregnancy. In this situation, the brain receives an insufficient amount of oxygen, its development processes are wrong and as a result - after birth, there is a tremor. Provocative hypoxia can be placental pathologies, intrauterine infections (both bacterial and viral), polyhydramnios, maternal vaginal activity or, on the contrary, too fast deliveries, umbilical cord entanglement, premature placental abruption, etc. Another question that often torments the youngMom - why there was a rash on the nose or on the child's chin. 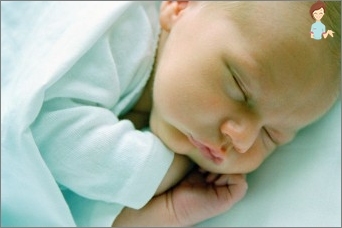 The skin of a newborn baby after delivery experiences many changes and adapts to life "outside". Various endocrinological processes in itCan cause a small physiological rash without obvious signs of inflammation. These are small, not very conspicuous pimples, sometimes look like a white dot or droplet under the skin. Such a rash is not a cause for unnecessary anxiety, it does not require specific treatment and will disappear by itself - your baby's skin just adapts to the environment. But in cases where the rash is presentedReddish dots, with liquid contents or merges into large spots - this is already an occasion to call a doctor. Such phenomena can cause allergic reactions, severe infectious diseases, hormonal disorders or hereditary diseases. Do not delay with the consultation in time to recognize and stop the disease. Summarizing, we can say that at any ageHaving found out in the child a tremor or an eruption, it is better to reinsure and address to the doctor. But, even if your baby has some kind of pathology, the earlier you find it, the easier it will be to eliminate it.